The Mac App Store is going to be huge. Sure, you look at it now and see that it’s largely populated with a lot of apps you don’t want and will never want. But there are already quite a few gems (namely some key games) on day one. And the smooth execution of how it works makes it very clear that this is the future of software distribution for the Mac platform. And some of those apps themselves also speak to the future of the platform. It’s no accident that Apple baked the Mac App Store directly into OS X rather than making it a stand-alone app. Apple clearly means for every Mac user to eventually have it. In a way, you could almost think of it as really the first feature of OS X Lion, we’re just getting it a few months early. And why not? If Apple realized they could make it work with OS X Snow Leopard, why force all users to upgrade to get access to it? Apple will continue to sell software from their Apple stores, but the selection will dwindle over time. It will start with the Apple-made apps — the key pieces are in the Mac App Store on day one. The other big Mac app publishers will eventually get on board because they won’t be able to turn down this new built-in distribution channel. But there’s something deeper going on here. 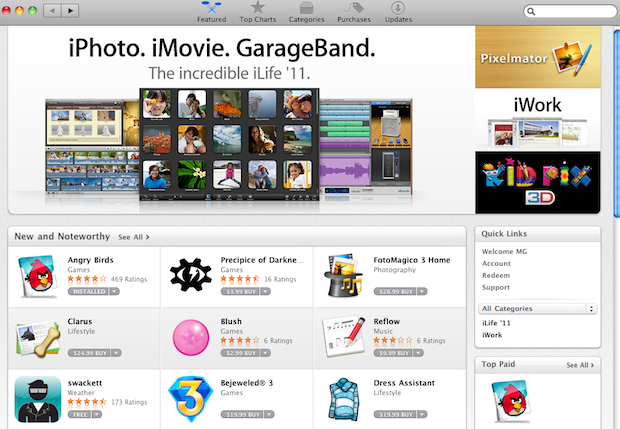 Look at the two most popular apps right now: Twitter for Mac (free) and Angry Birds (paid). Twitter looks more like an iPad app than a Mac app. Gone is the dated “Aqua” user interface that most Mac apps still carry. It has been replaced by a sleek, black and gray UI. It’s something that seems to look a bit like what people originally thought a new “Marble” interface could look like. Gone are the light blue scroll bars. Instead, Twitter has a light gray scroll bar that seems to blend into the side of the app. It looks a bit like the latest version of iPhoto and QuickTime. And that’s probably not an accident. This should be closer to what more OS X apps start looking like starting with Lion. At least I hope that’s the case — it looks great. Angry Birds points to something a bit different. You open the app and you have no choice but to go full screen. This is another feature touted in OS X Lion, full-screen apps. And it’s something Apple has learned from apps on the iPad, and is borrowing. Windows are being shut — or rather, fully opened. This full screen experience allows you to navigate the app more easily with touch. Yes, you can use your mouse to play the game, but it’s a much better and more seamless experience if you have a Magic Trackpad (or a MacBook trackpad). It’s just like a bigger version of the iPhone/iPad game. 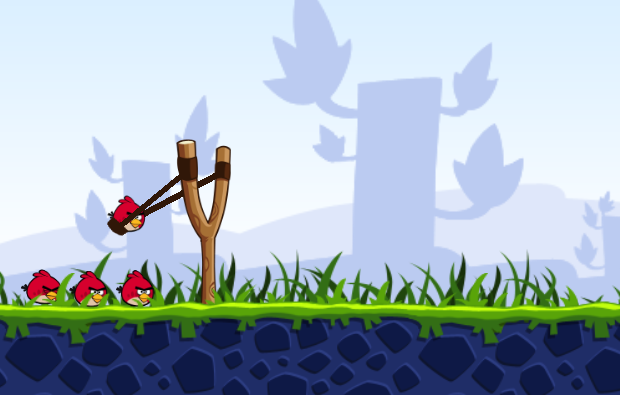 You swipe your finger to pull back the bird and let go to fire. To bring up the menu, you swipe three fingers down. To zoom in or out, you pinch. To move the view to the right or left, you use two fingers. We’re seeing the shift to touch on the desktop happening before our eyes with apps like this. It’s no longer going to be point-and-click but flick-and-swipe. And Angry Birds isn’t alone there. Other apps that were iOS-first, like Flight Control, also utilize the Magic Trackpad if you have one for a touch experience. Or if you have a MacBook, you’re set to go with the trackpad on those. These are the new breed of apps that I suspected we might see in the Mac App Store. They’re apps that were iOS first, but now are moving to the Mac. They’re sort of micro-apps that are built around a touch experience and ported to the Mac with the help of the trackpad and a virtual cursor. Games are the first to come, but there will be others. And there will be many new hybrids. Using the Mac App Store for the past few hours, my overall thought is: how did Apple not do this sooner? You click to download an app and it’s done. No tricky installation needed. And you hop on to a different machine and can re-download any app you’ve already bought. Updates are all centralized. And I’ve probably spent more today on apps than I have in the past year total. Now just imagine when the apps get really good. And when some of these hybrid ones I’m talking about start hitting the store. Yeah, the Mac App Store is going to be huge.